In catastrophic situations, phone lines are disrupted, power is lost, and cell signals can be overwhelmed. It’s critical that we re-establish communication. That requires energy. Lots of it. 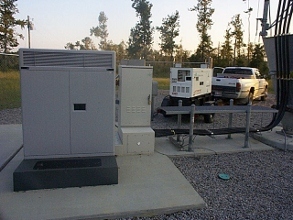 We deploy a massive array of power generators to your site. We own one of the largest private generator fleets in the country with the capacity to generate 5 Megawatts of power. To put that in perspective, that’s enough to power 100 city blocks. Our services get your business network back online so data and voice can start moving again.